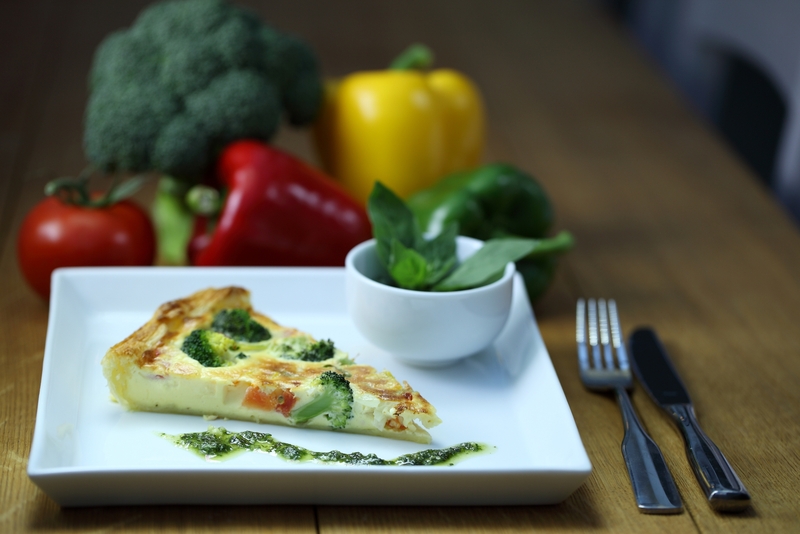 This classic vegetable tart recipe combines fresh and colourful vegetables, a creamy filling and a delicious sauce that makes for a splendid supper to enjoy outside on a warm summer evening! Lightly grease a 16cm springform flan tin and line with the pastry. Add the tomatoes, cream and eggs and mix all together. Season to taste with salt and pepper and then spread the mixture over the pastry. Sprinkle with Manchego cheese and place the tart in the oven at 195˚C for 25-30 minutes. To make the sauce, lightly toast the pine nuts in a pan and then place in a food processor with the garlic, basil and Manchego cheese. Continue to blend whilst slowly adding the olive oil until smooth. Place the sauce in a small bowl to serve with the tart. What are your favourite tart or flan recipes? If you want to ring the changes I have a beautiful fruit tart recipe for you. You might even prefer a traditional treacle tart option. If you happen to be away from home and looking for healthy food choices, check out top tips for travelling when you are a vegetarian.